In a saucepan melt 2 sticks of butter or margarine. 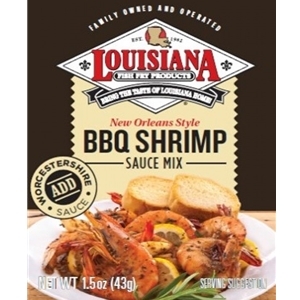 Add ½ cup of water, ½ cup of Worcestershire sauce and contents of our LA Fish Fry BBQ Shrimp mix. Simmer for 5 minutes on low heat Place 2 ½ lbs. of unpeeled shrimp into a baking dish with shrimp not more than 2 layers deep. Pour sauce over shrimp proportionally. Bake at 375ºF for 20 minutes, turning shrimp several times. Serve with French bread for dipping. For added flavor, layer lemon and/or onion slices over shrimp before baking. Ingredients: Salt, Spices, Dried Garlic, Sugar, Rosemary Leaves, Paprika, Caramel Color.